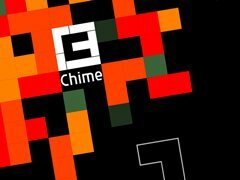 Chime is an XBLA game that looks, on the surface, like Just Another Block Game. From the first screen shot you probably have a good idea of what you are getting into, since there are probably two dozen other Arcade games and a hundred Community games that look like the same thing. So what sets this apart from the rest? Well, that’s what we will be looking at. The graphics in this game are nothing special. You’ve got a pile of iridescent blocks, a grid, and lots of lights pulsing in time with the music. The information you need is well presented, though as time runs out the screen can start to over stimulate you with its red flashing. The best thing I can say about the visuals is that they are everything that is necessary and very little more, since this game really isn’t about the visuals. When I first picked up this game, I tweeted that it was a potent combo of FruityLoops, Tetris, and Heroine. I stand by that… though the geek in me would just like me to point out that technically I should have said Pentris, since you are in fact dropping five block pieces and therefore pentominos not tetrominoes so… yeah, you know what, moving on. You build rectangles with your pieces. Bigger rectangles, more points. The rectangles take some time to set, and if you fill up a side, you extend the rectangle, boost the score, and reset the clock. Keeping these shapes going is uncannily like juggling, a point not missed by the folks who name the achievements. Once the rectangle is set, a beat line that is constantly cycling across the board punches it down into the field, ticking up the coverage percent. If you hit 100%, you get a massive point boost and move to the next level. In order to build the score even further and rev your frenzy even more, any pieces left over are only good for a few passes of the beat line. Every completed rectangle ticks the score multiplier up, but if even one of the leftover pieces expires, your multiplier is gone. The only interaction the player has is to move, rotate, and place pieces. For that reason I hardly had to write all any of the previous two paragraphs. You know how the game is played. It is a tried and true game type, and this game does it as well as any other. The different levels, aside from their different music, each has a different shape, which is a refreshing addition to the standard game type. Excellent work is done to keep the pace fast. The timed mode is in particular kept desperately frantic as you try to earn extra time with coverage and reach that elusive 100%. Ostensibly, Chime is all about the sound. The game plays as a techno sequencer. The levels are, in fact, songs, and songs by some big names in music. Names like Philip Glass and Moby. I know that these are big names in music, because I have heard of them… I’m not up on my rockin’ tunes. Each time you lay down a block you get another element to the looping music. It works well, slowly building the soundtrack as the field fills. If you like techno music, you will be happy, because you are essentially building your own song with each play through. If you don’t like techno music, hit mute. It is a dark and dystopian future. Music has been forbidden. In order to enforce that law, bombs have been placed in every population center. The only way to disarm the bombs is to activate the entire control panel with an impossibly large number mismatched keys. Five bold musicians take it upon themselves to topple the regime with their techno mastery. Okay, there is no story that I know of, but that would be a pretty good one, huh? Chime is exactly the sort of game that XBLA thrives upon. It is a quick in, quick out game with flashing lights, fluorescent colors, and simple rules. It is, in short, a casual game. That isn’t a crime, though. It hits the mark in all of the areas that count for the genre, and in the case of sound and raw addictiveness, knocks it out of the park. 7.5/10. A standard block dropping XBLA game that gives you everything you expect from it, plus better than average audio.